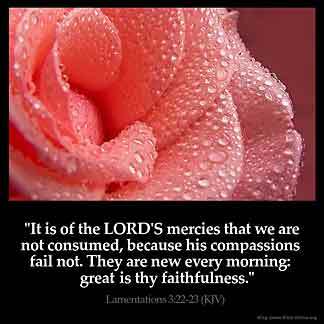 LAMENTATIONS 3:22 KJV "[It is of] the LORD'S mercies that we are not consumed, because his compassions fail not." 19Remembering mine affliction and my misery, the wormwood and the gall. 20My soul hath them still in remembrance, and is humbled in me. 21This I recall to my mind, therefore have I hope. 22It is of the LORD'S mercies that we are not consumed, because his compassions fail not. 23They are new every morning: great is thy faithfulness. 24The LORD is my portion, saith my soul; therefore will I hope in him. 25The LORD is good unto them that wait for him, to the soul that seeketh him. � It is of the Lords mercies that wee are not consumed, because his compassions faile not. `It is of' Jehovah's lovingkindnesses that we are not consumed, because his compassions fail not. The kindnesses of Jehovah! For we have not been consumed, For not ended have His mercies. Surely the LORD'S mercies are not consumed, surely His compassions fail not. God loves as and we live because of his power his grace, and if it was on our own strength, we would be no where. I thank my living God. God is faithful : He could have wiped out the whole human race : He didn 't He chose to love me and forgive me : As He does all people : His compassions fail not and His mercies are new every morning : Yes and Great is His faithfulness !!!! I think the mercies of God is inexplicable, may his compassion dwell forever.